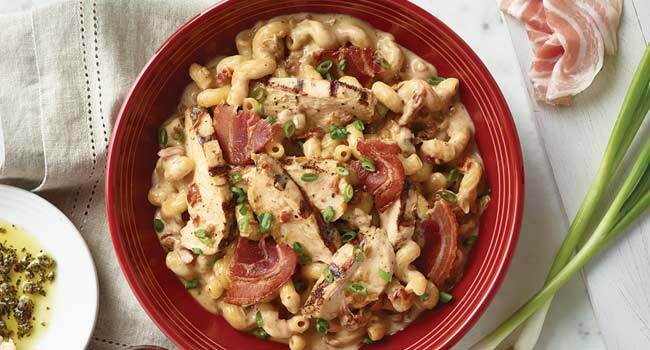 Carrabba's is offering these comforting, hearty dishes for the winter season favorites. Product availability and participation may vary by location. 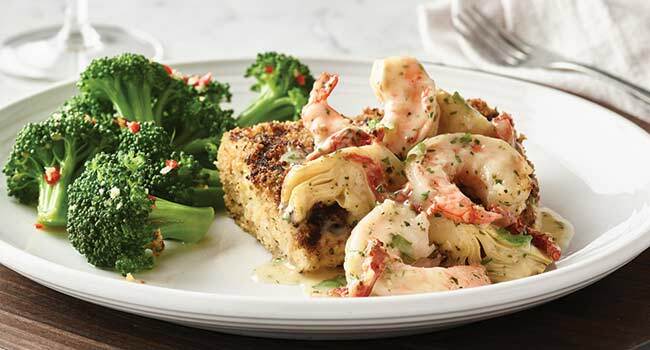 Carrabba’s Italian Grill has a new “Pasta Trios” special starting at $14.99. To prepare: In a large saute pan, heat the olive oil over medium heat. Add the sausage and cook, stirring, until the sausage starts to brown, about 3 minutes. Add the onion and the red pepper and continue to cook until the sausage is cooked through and the onion is soft, another 3 to 5 minutes. Add the garlic and cook 1 minute more. In a large pot of boiling salted water, cook the pasta until al dente, drain well, saving 1 cup of the pasta cooking water. Return the sausage pan back to a medium heat. 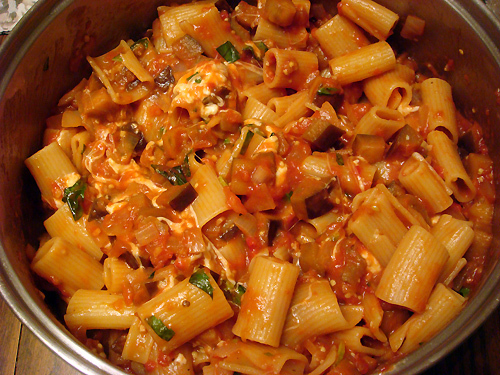 Add the drained pasta, the tomatoes, zucchini, goat cheese and the herbs and toss well. Add enough of the pasta water to moisten and make a nice sauce. The goat cheese should totally melt, become creamy and coat the pasta. Add half of the grated Parmigiano cheese and toss again. Season to taste with salt and pepper. To serve: Transfer the pasta to a warm serving bowl or pasta platter. Serve, passing the remaining grated Parmigiano Reggiano cheese. Peel two oranges with a vegetable peeler removing just the peel and leaving the white membrane attached. Slice this thin peel into narrow julienne strips, and set aside. Peel all the oranges with a sharp knife removing all the white membrane. Cut into 1/4 inch slices and set aside in a glass bowl. In enamel, Pyrex or other non-reactive saucepan, combine the wine, water, and sugar. Add all but 1/4 cup of the julienned peel, tangerine or lemon slices, cloves, and cinnamon. Bring to a boil, immediately lower the heat, and simmer until reduced by half and sauce has become syrupy, about 35 to 45 minutes. Strain out the spices and fruit peel-through you may wish to reserve the cinnamon for garnish. Serve by pouring the warm, or chilled, wine sauce over individual portions of the sliced oranges. To Prepare: Salt eggplant slices lightly on both sides with kosher salt. Place slices in a colander. Put a plate on top of the eggplant. 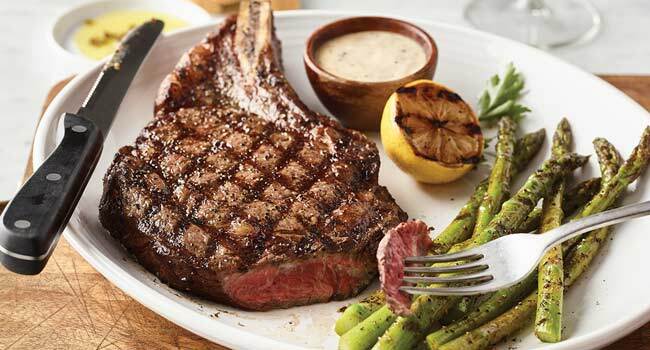 Place a heavy weight on the plate. Let the eggplant sit for 30 minutes. Rinse eggplant with cold water. Pat dry with paper towels. Cut eggplant slices into 1-inch cubes. Heat 1/2 cup of the olive oil in a large skillet over high heat, until very hot. Add the eggplant and cook until golden brown and cooked through. Drain eggplant on paper towel lined pan. Set aside. Place a large pot with 6 quarts of water on the stove to boil. In a large skillet, heat remaining 1/4 cup of olive oil over medium heat. Add the onion, stirring frequently until the onion is very soft and starting to caramelize. Add the garlic and saute for 5 minutes, then remove the garlic and add the chopped anchovy. Cook another minute to let anchovy dissolve. Add the tomatoes and sugar. Raise the heat and bring sauce to a boil. Reduce heat, add salt and pepper to taste, and the red pepper, and let simmer 10 minutes, stirring frequently. Stir in the carpers, eggplant, and herbs. Add 2 tablespoons of kosher salt to the now boiling water. Drop the pasta in the pot. To Serve: When pasta is al dente, drain and add to the skillet with the sauce, over a low heat. Toss, add the shards of caciocavallo (or Provolone). Toss for 1 to 2 minutes or until the cheese is soft and gooey. Transfer pasta to a warm serving platter. Sprinkle over with grated caciocavallo or Romano. Serve, passing extra grated cheese. To Prepare The Ragu: In a large pot, heat oil over medium heat. Season the pork and veal with salt and pepper and, when the oil is very hot, add to the pot and brown meat well on all sides. Add the onions to the meat and cook, stirring often, until onions are soft and start to brown. Add garlic and cook 1 minute more. Deglaze the pan with the red wine, scraping up all of the browned bits on the bottom of the pan. Add the tomato paste and cook 2 to 3 minutes stirring constantly. Add the pureed tomatoes and the water, bring the contents to a boil and then reduce to a simmer. Season ragu with salt, black pepper, and red pepper and simmer sauce partially covered for 1 hour. Remove the sausage from it's casing and break into 1-inch pieces. Add the sausage to the simmering ragu and cook 30 more minutes. Turn off heat and set ragu aside. To Prepare The Filling: When ragu is in the last 30 minutes of simmering place 3 tablespoons of the olive oil and 2 cloves of garlic, crushed lightly, over medium heat in a large skillet. When the oil is very hot and the garlic starts to brown, remove and discard garlic and add the zucchini. Season with salt and pepper and saute, stirring occasionally, until the zucchini is browned and cooked through. Add half the parsley. Transfer cooked zucchini to a plate or pan and set aside. Add the remaining oil and the others 2 cloves of garlic lightly crushed, over medium heat. When the oil is very hot and the garlic starts to brown, remove and discard garlic and add the mushrooms, season with salt and pepper and saute, stirring occasionally, until the mushrooms are browned and cooked through. Add the remaining parsley. Transfer the cooked mushrooms to a plate or pan. If using fresh peas, boil in lightly salted water until tender. Drain and submerge in ice water immediately, drain and set aside. If using frozen peas, thaw and set aside. Bring 10 quarts of water to a boil in a large pot and add the salt. Cook the pasta in the water until 2 minutes from al dente. Meanwhile, butter a large deep casserole and coat with 1 to 2 tablespoons of the breadcrumbs. When the pasta is done , drain and toss it in a bowl with 1/2 the ragu. Transfer 1/4 of the pasta to the bottom of the casserole. Top with a little of the extra ragu. Distribute the zucchini over the pasta and cover with 1/3 of the grated Romano and 1/3 of the mozzarella. Top with another 1/4 of the pasta, a little sauce, the mushrooms, and remaining Romano and Mozzarella cheeses. Cover with the last 1/4 of the pasta, a little sauce, top with bread crumbs and dot with butter. Bake for 30 minutes at 350 degrees. Remove from the oven and let rest 15 to 20 minutes. Serve, passing extra Romano cheese. To Prepare: In a food processor,blend together the basil and the garlic, then add the almonds and blend to a rough chop. Add the tomatoes and olive oil and puree. Season with salt and pepper to taste, then blend again. Bring 6 quarts of water to a boil. Add 3 tablespoons kosher salt. Add the pasta and cook until al dente. Drain the pasta, saving some of the water to thin the pesto sauce. 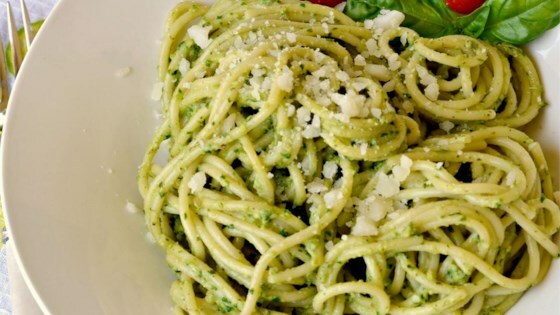 Mix enough of the water with the pesto sauce to get the desired consistency. To Serve: Spread about 1/2 of the presto sauce on the bottom of a warm serving platter, and transfer the pasta on top, then pour the remaining pesto on the pasta and toss, then serve immediately. To Prepare: Soak the fava beans, chestnuts, dried beans, and chickpeas, overnight in a pot of cold water. Drain and place in a large stockpot with 10 cups of water. Bring to a boil, reduce heat and simmer for about 1 hour. Add the split peas, lentils, onion, celery, escarole, tomatoes, fennel seeds, fennel, and dill weed. Season with salt and pepper. Simmer another 1 1/2 to 2 hours or until beans are tender. Add more water if needed to thin to a soup consistency. To Serve: Turn off heat, taste and re-season, if needed. Add olive oil. To Prepare: Clean and rinse the scallops and set aside. Combine the flour with the salt and pepper. In a large skillet, heat oil over medium-high heat. Dredge the scallops in the flour mixture, shaking off any excess. Cook the scallops until they are golden on both sides, being careful not to overcook-it makes them tough. Remove scallops and set aside. Add the scallops and fennel to the saute pan and cook over medium heat for about 2 minutes. Add the garlic and cook 1 minute more. Remove the pan from the heat and add the Sambuca. Return the pan to the heat and ad the orange zest, the orange juice, and the wine and simmer until slightly thickened, 3 to 5 minutes. Whisk in the butter and chives and ad back the scallops long enough to heat through. 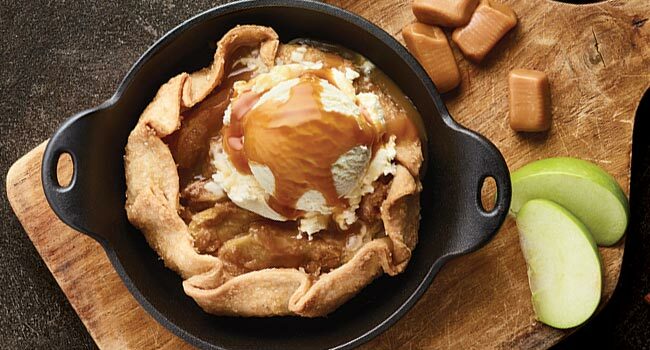 Turn onto a platter and serve immediately.